So you’ve made your list and checked it twice, but who decides if you were naughty or nice this year? As a woman and/or mother, everyone else often comes first, especially around the holidays. However, don’t forget to create a wishlist for yourself! If you’re not sure what to ask for, beauty and lifestyle gifts are always a hit and tech gifts continue to top wishlists among all ages and genders. Whatever your interests are, there’s sure to be something on this gift list that’ll catch your eye and leave you giddy with holiday cheer. If tattoos aren’t your thing, you can still wear your child’s handwriting or artwork on your body at all times. BigEjewelry creates bracelets, necklaces, and other jewelry from handwriting and kid’s artwork that’ll last a lifetime. 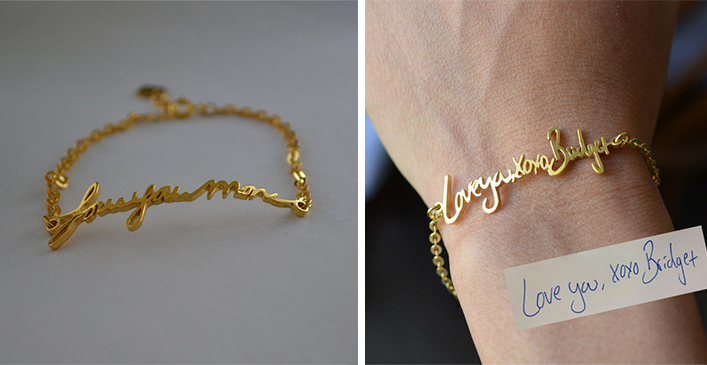 Just send them a photo of the artwork or handwritten phrase of your choice alongside your wrist’s measurement and they’ll create a custom piece of jewelry just for you. Choose from gold plated, sterling silver, or white gold plated to suit your style.